So i was looking through my blog and trying to get some things updated when i noticed my bucket list. I read through just to make sure i hadnt accomplished something and forgot to blog it. Well i DID! number 44. Ski a black <>! This last march i went with my husband and his youth group to Colorado, Winter Park Resort and we finished our last run of the last day on a black diamond with moguls. if you ski you know that those are the hardest thing to ski! they are windy and bumpy and you have to have full control of you skis the entire time! There is NO relaxin on a mogul! well i am so glad to say that i made it down and i was so excited. I only get to ski once or twice a year if im lucky, so after three years of skiing thats really only 12 days ive ever skied. not bad huh? 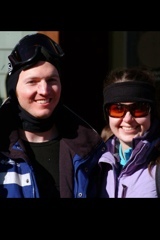 everyone should try snow skiing at least once! you will love it! just take lessons or find an awesome teacher like i did...my hubby!